You might want to sit down for this one, because in this post, I’m combining some of my favorites: Taco Tuesday, Breakfast for Dinner, and Southwestern Food. That’s right, all three in one easy, simple, delectable recipe. Let’s do this! The inspiration for the recipe came from Sabra’s latest innovation: Guacamole Veggie Fusions. The guacamole comes in 3 flavors: South Western, Mango Lime, and Garden Vegetable. In addition to being ready at your slightest guacamole craving, these creations have 30% less fat than a classic guacamole and are made with 7 different varieties of crisp vegetables. What’s not to love? In case you’re curious, the South Western Guacamole that I chose for this recipe included Hass Avocado, Onion, Yellow & White Corn, Black Beans, Tomato, Red Bell Pepper, Red Chili Pepper, Salt, Cilantro, and seasonings. 1. Heat oil in a nonstick pan over medium heat. Whisk together eggs, water, and salt. Add to the pan and scramble to your liking. 2. Assemble tacos: evenly divide guacamole among 4 tortillas and top with eggs, steak, cheese, cilantro, and lime juice. 3. Get your napkins ready and devour! Disclosure: I was provided with the product by Sabra and compensated for this post. All opinions are my own. It might be cliche, but breakfast really is the most important meal of the day. But when every free minute in the morning is worth its weight in gold, you want breakfast that’s quick, easy, and can be prepared ahead of time. This Quinoa, Chicken, and Zucchini Egg Bake fits every category. It is loaded with protein, vegetables, can be baked the night before, and quickly reheated in the morning while you pour yourself a cup of coffee. What’s even better? 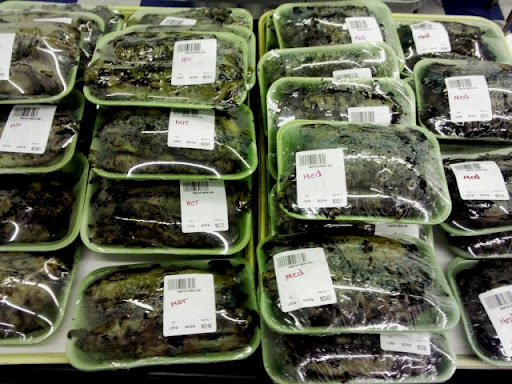 You can freeze the bake in individual portions and have them ready to go when needed. I’ve prepared a similar recipe in a muffin pan, but honestly, it took longer to remove the egg cups out of the muffin pan than I care to admit. With this version, there’s less sticking, and it bakes in the same time. I’ve cut the bake into 8 servings, think of it as 1 egg per serving. 2. Heat oil over medium heat. Stir in onions, garlic, and sausage. Cook until onions are browned and softened, 5-7 minutes. 3. Stir in zucchini and cook until slightly soft, 3-5 minutes. Mix in quinoa and cool. 4. 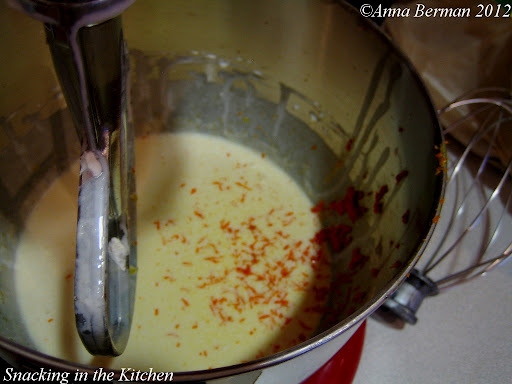 Whisk together eggs, milk, and seasonings. 5. Layer quinoa on the bottom of the greased baking dish. 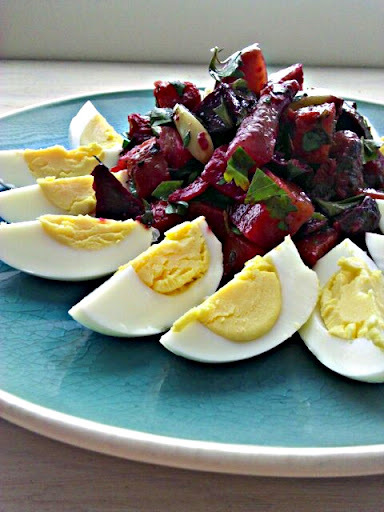 Top with whisked eggs and bake until set, 30-35 minutes. The beauty of this bake is also how versatile it is. Depending on the flavor of the sausage you use, you can play with seasonings and mix ins. Cheese is always a good option here – either mixed in with the eggs or sprinkled on top before baking. And speaking of mix ins – do try using different vegetables. I’m a fan of sauteing the vegetables first. Not only does it add flavor, but it removes moisture from the vegetables that helps keep the bake nice and firm. Ready to cook? Share your personal combination with me, post your photos on Instagram and be sure to tag @snackingkitchen. 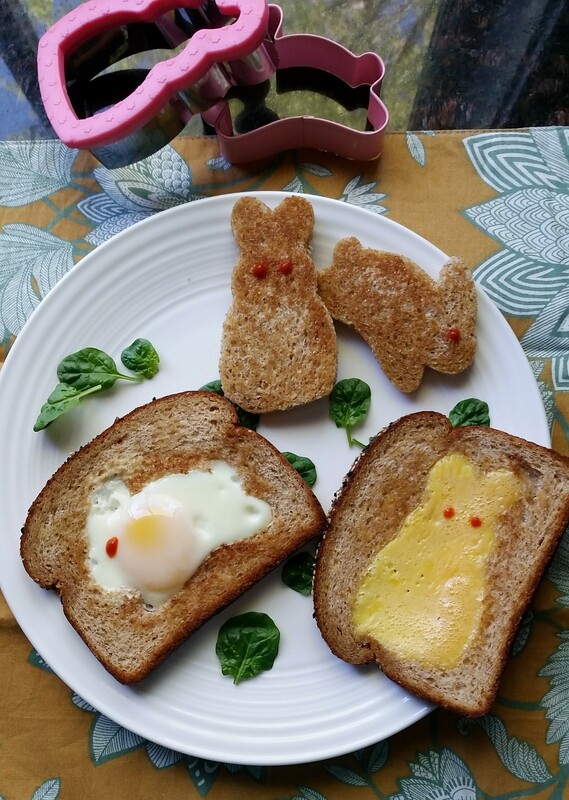 I wanted to share a really fun and easy idea for your Easter breakfast. 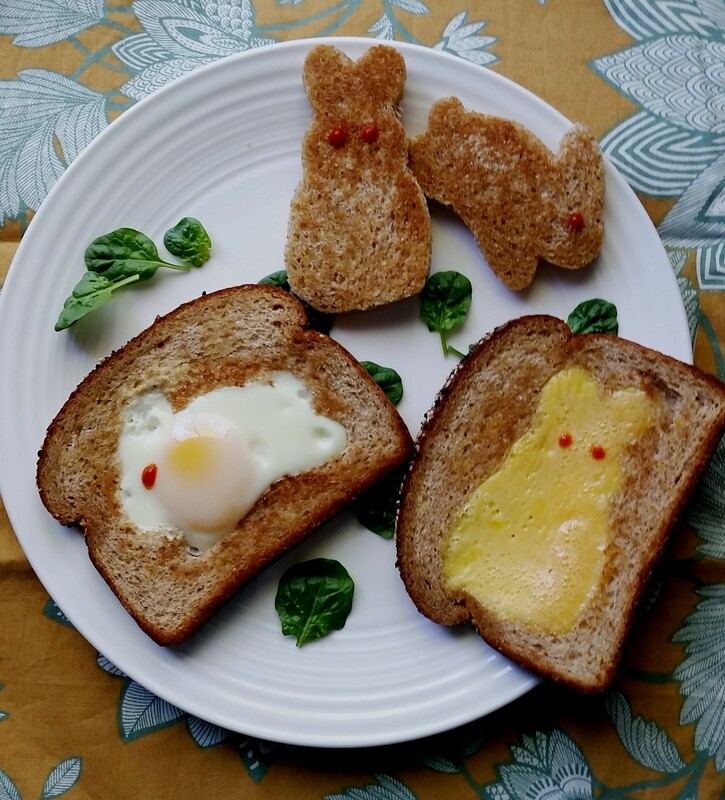 You’ll need a few slices of bread, a few eggs and bunny-shaped cookie cutters. Wait till your kids see this breakfast plate hopping to the table. Hopping, get it? 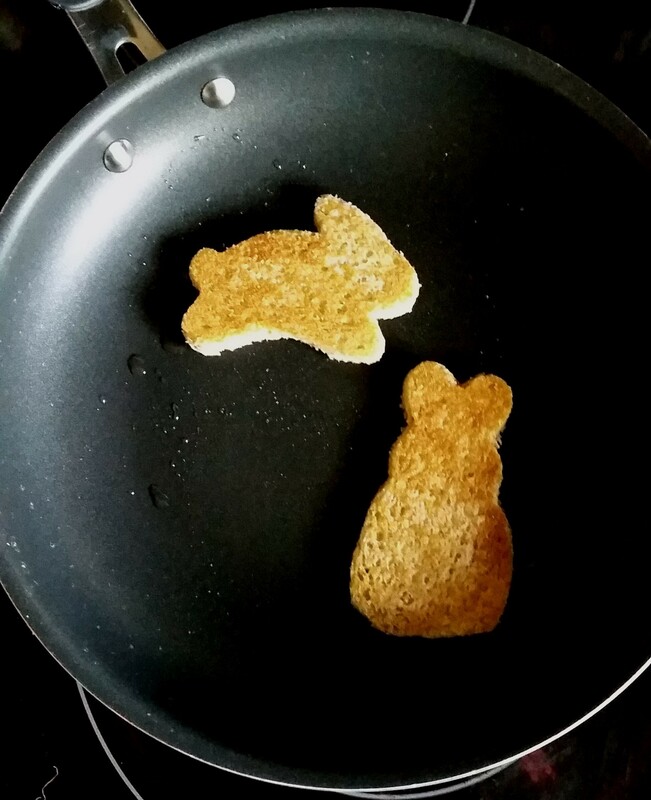 Start by cutting out the bunny shapes from two slices of bread. I had two shapes on hand, so I used one of each. You can certainly cut out the same shape, if you wish. Individually saute the cut outs in a little bit of olive oil until golden brown and crisp on both sides. 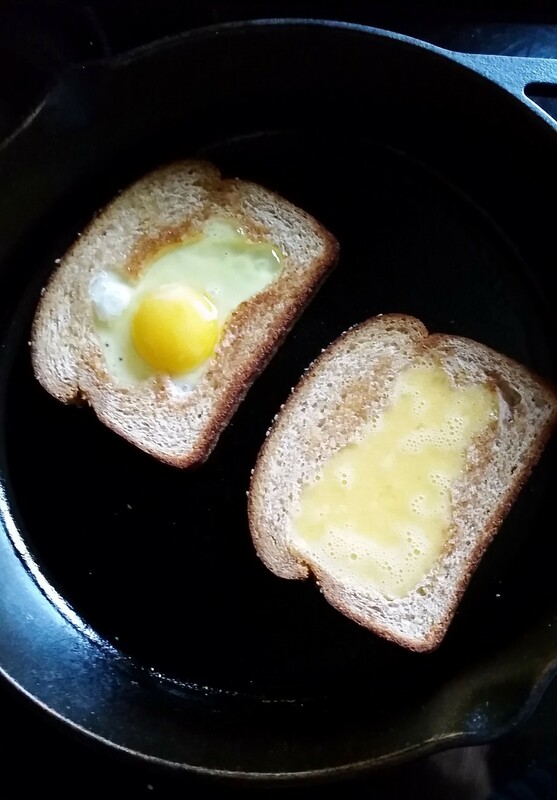 For the main toasts, sautee each slice of bread in a skillet over medium high heat until golden on one side. Then flip and carefully add in an egg. I used one whole and one scrambled egg for each slice. Lightly salt the eggs for flavor. And really, that’s all. 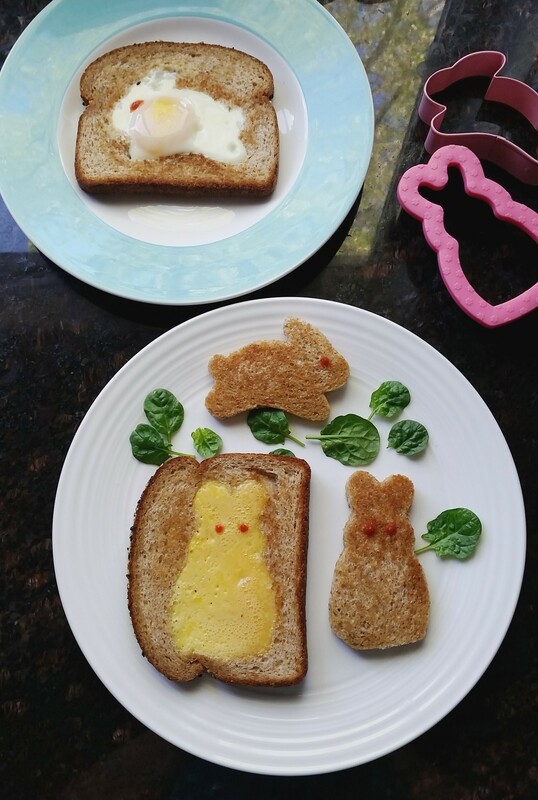 I served the toast with some baby spinach and added Sriracha eyes to each bunny. If Sriracha is too hot for your taste, you can use ketchup. If you are celebrating Easter, I’m wishing you a Happy one! 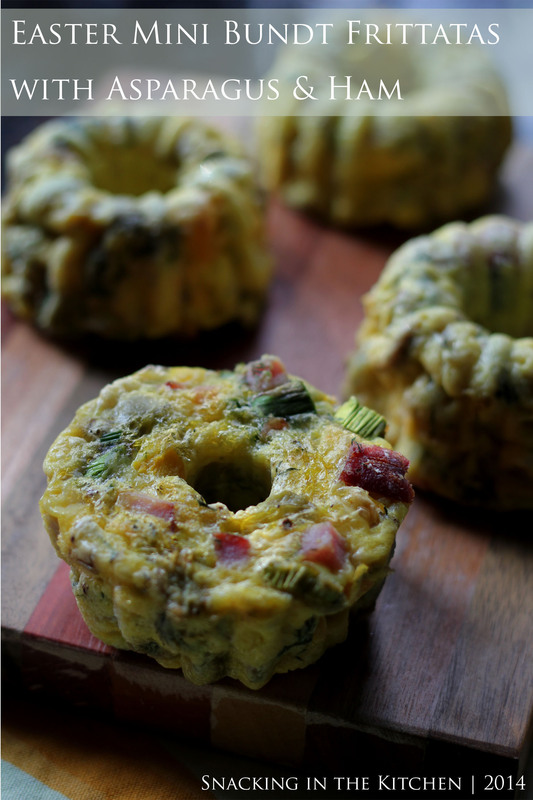 While Easter is not in my holiday rotation, I did want to share this recipe for Easter Mini Bundt Pan Frittatas that will be ideal to make with Easter ham leftovers. Serve this up for brunch and make an extra batch to pack for easy breakfast throughout the week. You can certainly bake these in a standard cupcake pan, but I was fortunate to find these gorgeous mini bundt pan at my parents’ and was happy to make it my own. 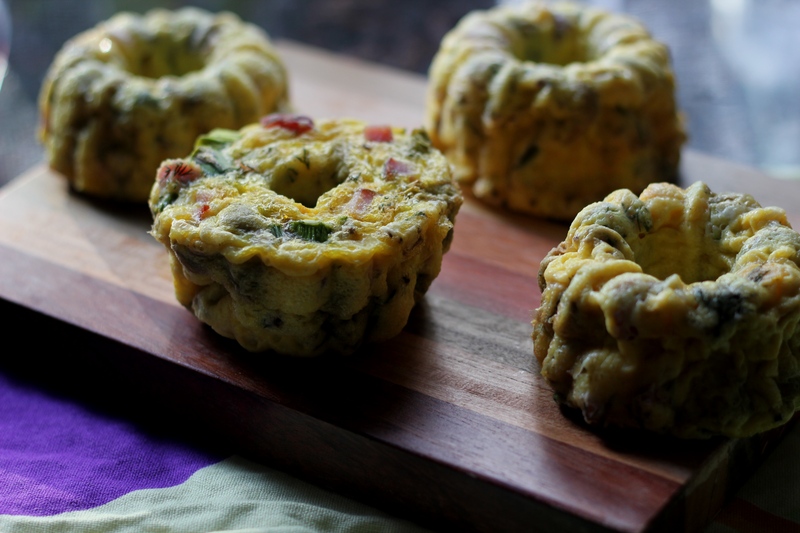 The frittatas were my first project and I’m certainly looking forward to future bundt creations! 1. Preheat the oven to 350 degrees F and grease a 6-container bundt pan with cooking spray or vegetable oil. 2. Combine ham, asparagus, bell pepper, olives and dill and divide evenly among the bundt pan cups. 3. Whisk together eggs with salt and pepper and pour over the filling. 4. Bake in the oven until puffy and the eggs are set, 20-25 minutes. And that’s it guys! 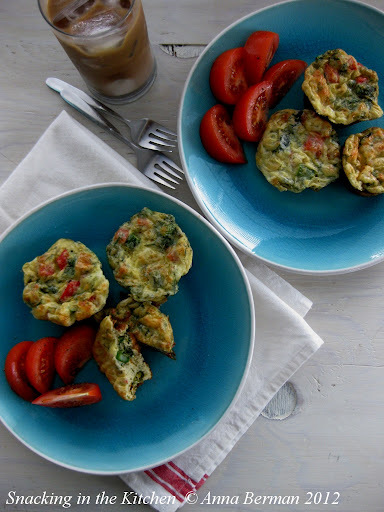 Hop on over to your table to enjoy these delicious frittatas. And as always, experiment with your favorite filling ingredients – cooked chicken, sauteed mushrooms and spinach, add a jalapeno for some spice – all appetizing possibilities! 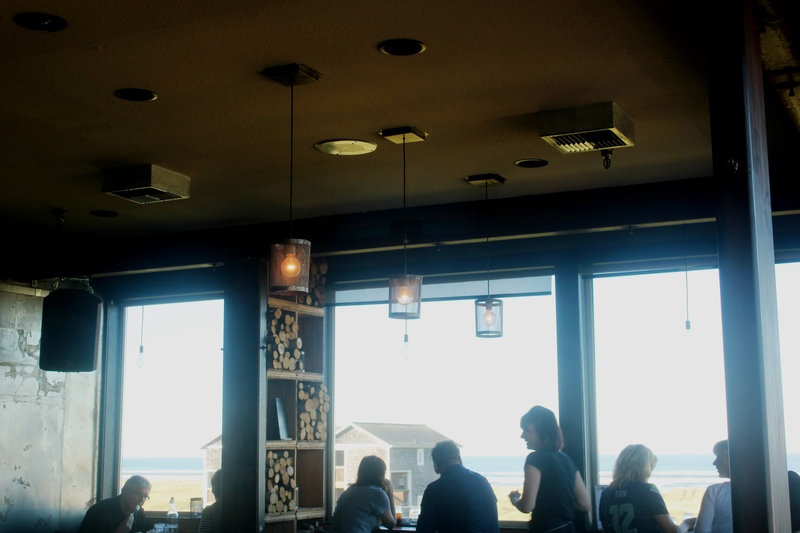 We spent the weekend in the beautiful Long Beach, Washington, just under four hours away from Seattle. This was an especially sunny and warm weekend for our fall, and we appreciated and treasured every moment of it. 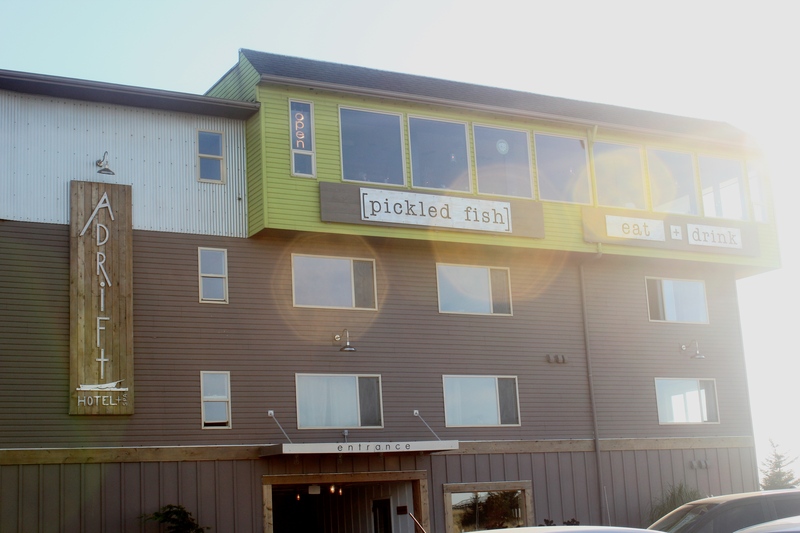 I booked a room at the Adrift Hotel & Spa (more on this later) and spent Sunday morning looking out at the beach from the windows of Pickled Fish – the hotel restaurant, located on the fourth floor. 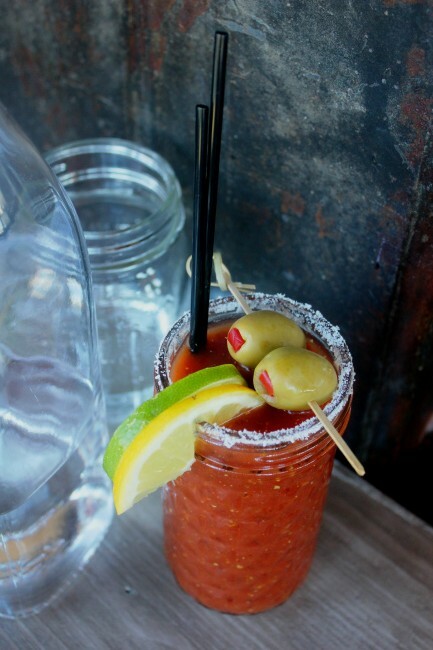 I started with a beautiful Bloody Mary, spicy and thick, stirred with celery sticks and garnished with two olives. The food choices were quite obvious. With the proximity to the ocean, we ordered Crab Cakes Benedict with roasted potatoes (they must have had truffle salt sprinkled on top). 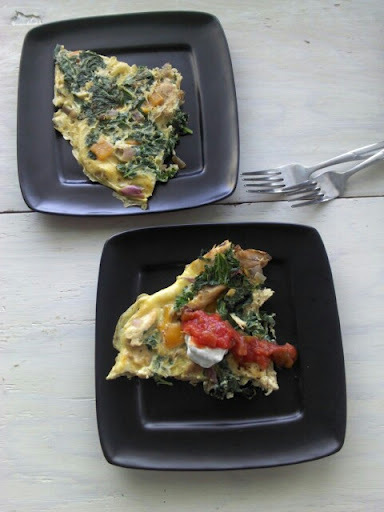 Our second choice was the Daily Frittata with local albacore, chanterelle mushrooms and bell peppers. The two arrived looking beautiful. The crab cakes were filler-free, light and sweet tasting of crab. And then we dug into the frittata, foraging for mushrooms. Alas, there were none! Not a single bite. I was quite disappointed, and informed our server. She didn’t argue too much. 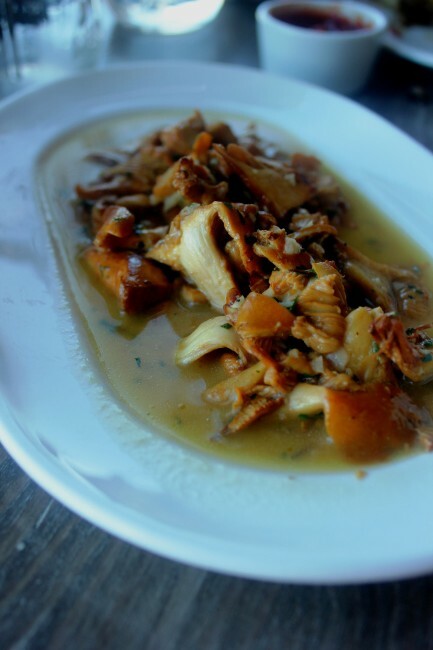 Instead, she returned with a heaping plate of butter sauteed chanterelle mushrooms. And just because we were on vacation, I thought dessert would be in order. 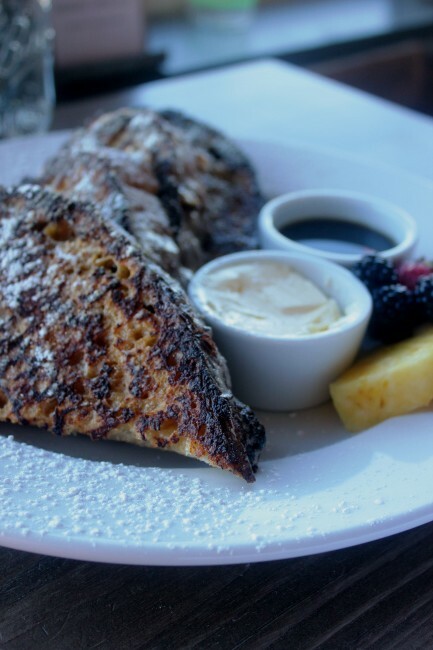 In came the plate with Brioche French Toast, garnished with berries, confectioners’ sugar, whipped butter and whiskey syrup. The best French Toast I’ve had in a long time. The bread was thoroughly soaked in the egg custard and soft in the middle, yet still crisp at the edges. I could’ve gone for an extra shot of syrup. Needless to say, we were happy and full. We spent the next few hours walking and horse back riding on the beach. Oh vacations! I have been waiting to share this with you and it’s finally time. We made Ramen Burgers at Allrecipes.com last week ~ by far one of the funnest and delicious video shoots I have had at work! 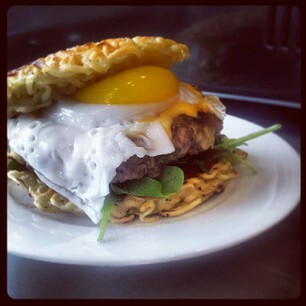 Have you heard of Ramen Burgers? The buns of these burgers are made from ramen noodles that you first cook and then drain and cool and mix with beaten eggs and shape inside bun-size ramekins. These are then cooked until crisp. Inside the burger is a beef patty seasoned with soy and sesame. 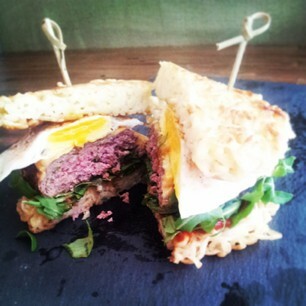 And it’s topped with a fried egg! You can find the complete recipe with measurements on Allrecipes.com, of course! Here, as always is the video! Looking forward to your feedback. Because there are only so many times you can turn eggs into an omelet or a quick scramble for breakfast , I came up with a new way to prepare this breakfast staple. 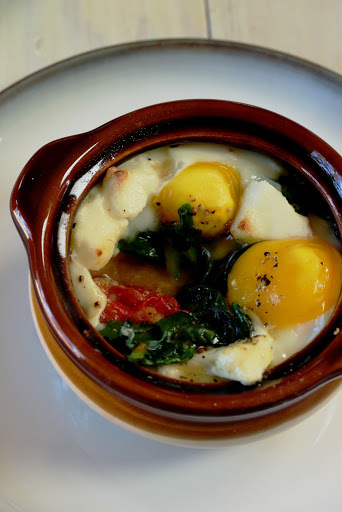 Baked Eggs with Roasted Tomatoes, Sauteed Spinach, and Queso Fresco. 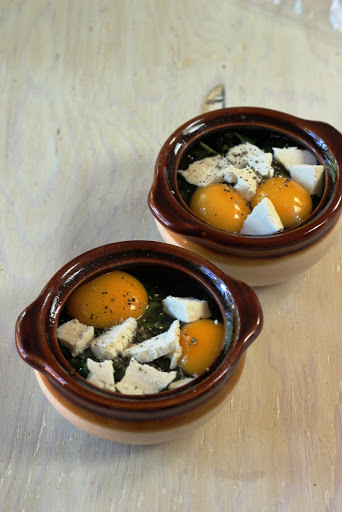 Perhaps I was inspired by the French Onion Soup that I had prepared and styled for work earlier in the week, but the idea of placing eggs into traditional ceramic crocks intrigued me. I just happened to have a batch of roasted Roma tomatoes on hand and so the layering process began. Soon enough the Artist and I sat down to a breakfast of individual baked egg scrumptiousness. 1. 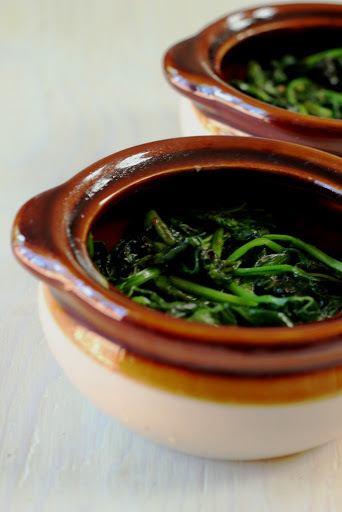 Preheat the oven to 375 degrees and lightly grease two ramekins. 2. Heat oil in a nonstick pan over medium heat. 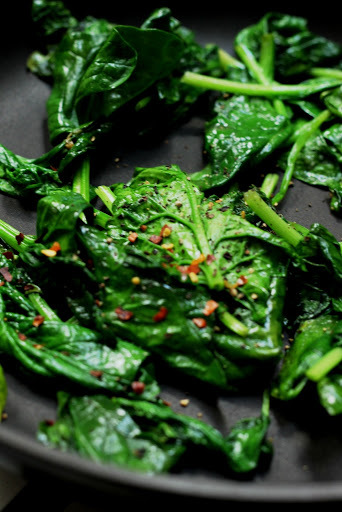 Add spinach, red hot pepper flakes, salt and pepper to taste and saute until spinach wilts, 3-5 minutes. 3. Layer roasted tomatoes on the bottom of the ramekins. 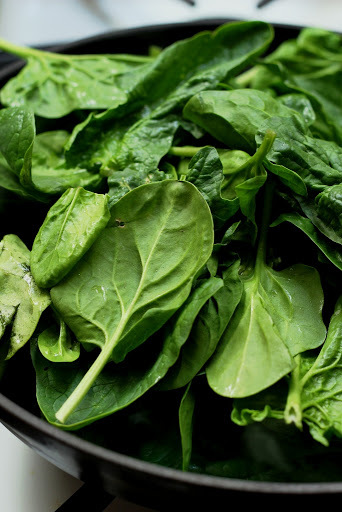 Cover with an even layer of sauteed spinach. 4. 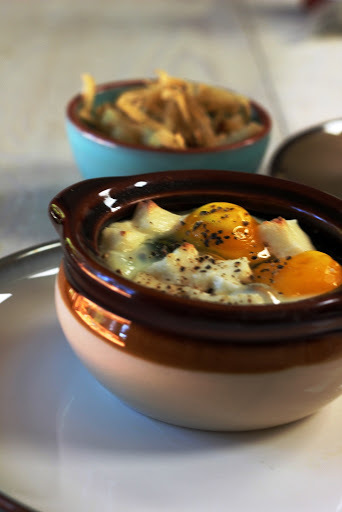 Break two eggs inside each ramekin and sprinkle with queso fresco. 5. Bake the eggs in the preheated oven until the whites are set and the cheese is slightly browned around the edges, 15-20 minutes. 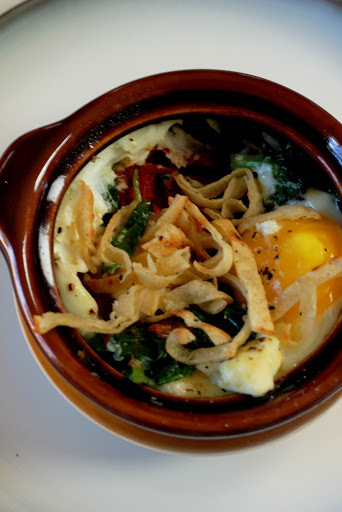 Serve the eggs with your favorite hot sauce and crispy corn tortilla strips. How fun and easy would this be for breakfast in your house? Enjoy! …But there you go again, there you go again, making me love you more! I’m talking about the sweet potato here people. I just can’t get enough. 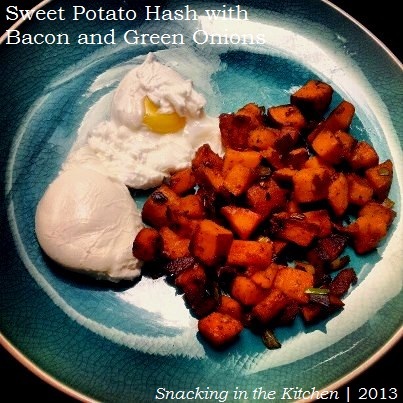 The trick to making a quick sweet potato hash is to precook the cubed potato in the microwave for a few minutes. The cubes get soft and tender and will crisp up and caramelize so much faster. Give this one a try! 1. 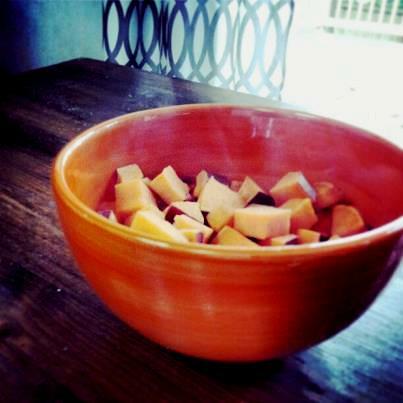 Place cubed sweet potato in a microwave-safe bowl and add a tablespoon of water. Cover with plastic wrap and microwave for 5 minutes. 2. Cook bacon in a cast iron skillet over medium high heat for 2-3 minutes. 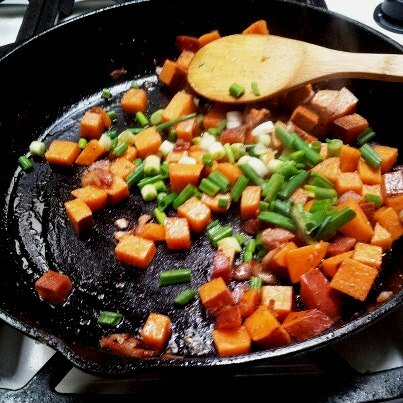 Add precooked sweet potatoes and cook until potatoes begin to caramelize, about 5 minutes. 3. Sprinkle green onions over the potatoes and season with salt, pepper, and paprika. 4. 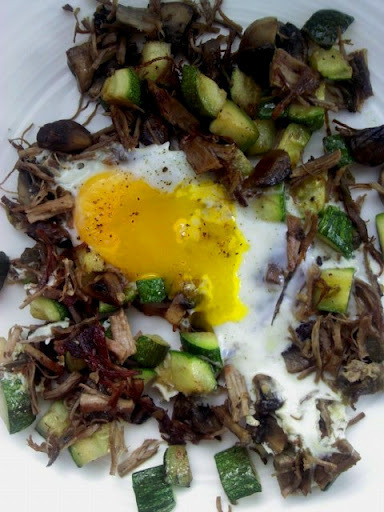 Serve with poached eggs and barbecue sauce. If you want to bump up this breakfast, you might add black beans, diced bell peppers, and tomatoes to the hash. Crumbled Mexican cheese, such as cotija would go well. Once again, it was time for breakfast. 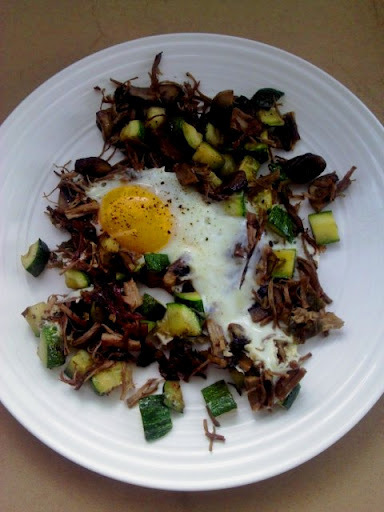 The eggs would be the star of the meal, but this time, they would bake in the oven, set atop sauteed red bell pepper and diced spicy pork sausage. 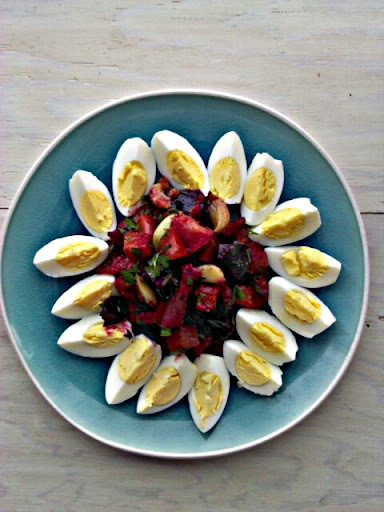 The beauty of this recipe is that it is as easy to make four eggs as it is a dozen. You can prepare the ingredients the night ahead and breakfast is almost ready in the morning. Let your imagination and refrigerator contents guide your filling ingredients. 1. Preheat the oven to 350 degrees and grease four muffin cups with nonstick oil spray or butter. This is crucial to grease well, otherwise the egg cups will stick and you’ll have a runny, cheesy disaster on your hands. 2. Divide pepper and sausage evenly among the four cups. You want them to come up no higher than half way, otherwise the egg would not have the space to rest. 3. 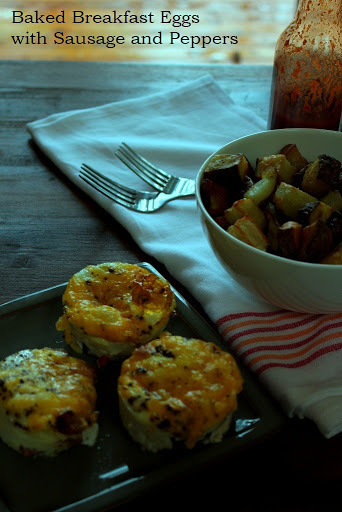 Top each muffin cup with an egg and sprinkle with a tablespoon of cheese. 4. 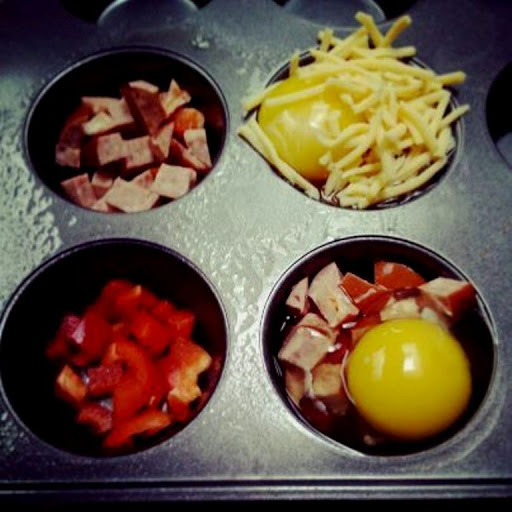 Bake the eggs in the preheated oven for 15 minutes or until desired doneness of the yolk. Cool the eggs slightly and carefully remove from the muffin cups onto a plate. A butter knife or a small, thin, flexible spatula will help you ease the eggs out of the cups. I served the eggs with a side of oven roasted potatoes and hot sauce. I would strongly recommend cooking your filling ingredients ahead of time if they are high in water content (peppers, tomatoes, mushrooms, spinach). I am in love with poached eggs. And smoked salmon. And a properly toasted English muffin. But I must admit to my dislike of Hollandaise sauce. Instead I chose to use salsa verde for its brightness, acidity and flavor. Simple enough. Toast an English muffin. I toasted mine three times to get the right crispness on the inside and the outside of the split muffin. 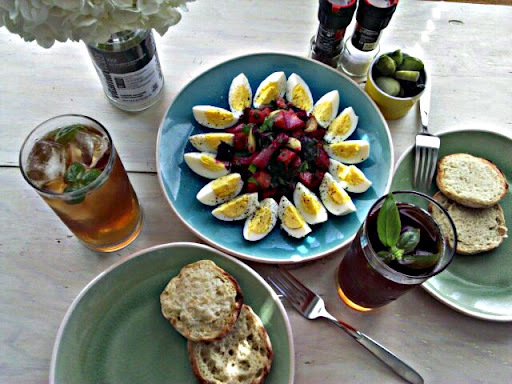 Poach an egg in barely simmered water with a touch of vinegar to keep the egg white coagulated. Carefully dry the egg on a paper towel to remove access water. 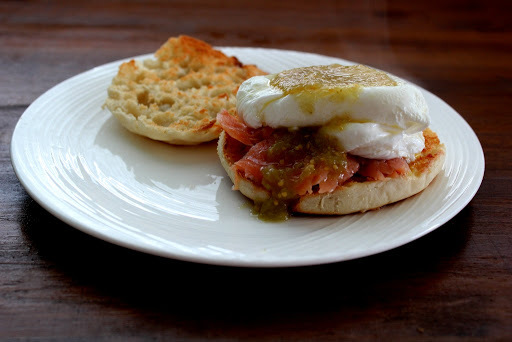 Lay smoked salmon on one side of the muffin and top with the egg. 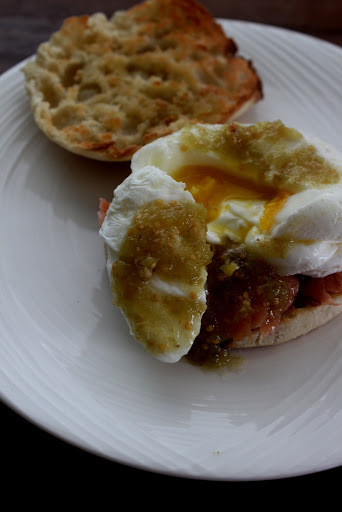 Spoon salsa verde over the egg and top with the second half of the toasted muffin. I spent the Labor Weekend in Santa Fe, New Mexico, touring the galleries with the Artist, strolling the streets, taking photos of colorful doors, and eating freshly-roasted Hatch chiles outside of the super market, on a bench, lined with newspaper. Out of the two varieties available, I chose “medium” which turned out to be unforgivably hot. Whether due to stupidity, or bravery, you decide, I ate two chiles, straight up, without a single accompaniment, through tears. 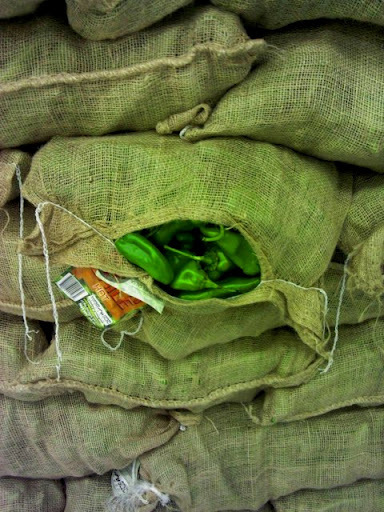 I packed up the rest of the Hatch chiles in a plastic bag and took them back on the plane to Seattle. The chiles did make it out of the bag at the Dallas-Forth Worth Airport, where they accompanied a plate of pulled pork barbecue. 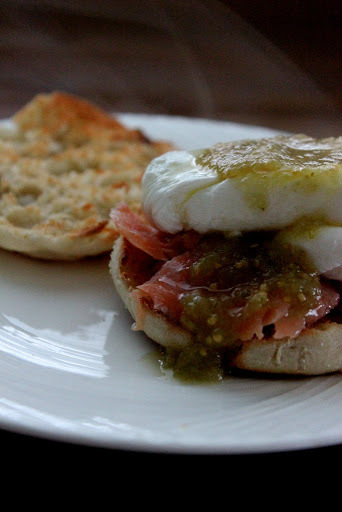 Back in Seattle, I made my version of Dr. Seuss Green Eggs and Ham, naming mine Green, Eggs and “Ham”. The green=Hatch chiles and zucchini and the “Ham”=shredded beef. 1. Heat oil in a large nonstick pan over medium heat. 2. 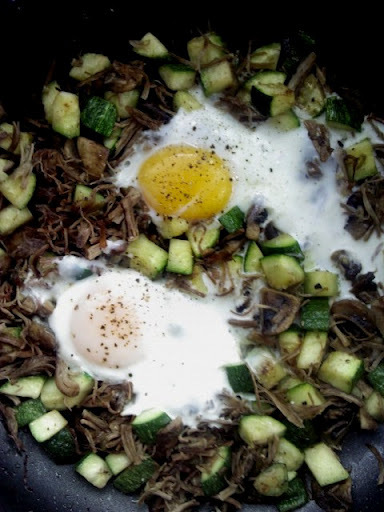 Add zucchini, mushrooms, chile, and beef. Stir and saute for 5-7 minutes until the vegetables are tender. Season with salt and pepper to taste. 3. 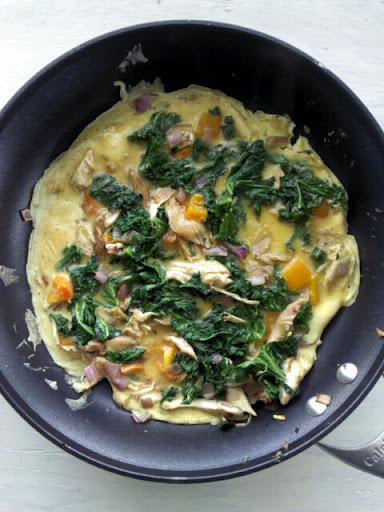 Break eggs into the vegetables, lower the heat and cover the pan with a lid. Cook until the eggs are your desired doneness. 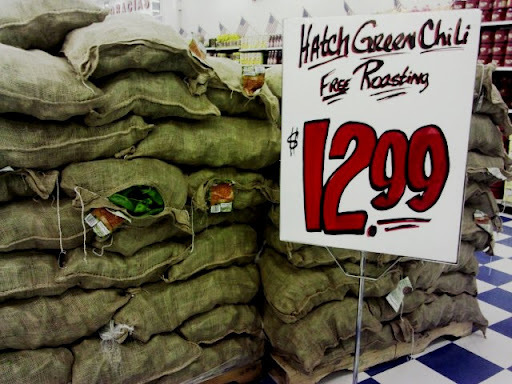 Are you a fan of Hatch chiles? How do you eat them? How spicy? Do you know how to cook eggs? Seems like a trick question, but I promise, there’s no trickery in mind. Cooking eggs is a pretty straight forward process if you know how to do it correctly, and once you do, you will never have to see a beautiful egg yolk trapped in a greenish-grey outline, or a hard-as-a-rock egg white. Instead, you will enjoy a beautiful, bright, lemony-yellow or slightly orange (depending on the chicken) yolk and a tender white. What’s inside counts, but so does what is on the outside … I’m talking about perfectly peeled eggs. It’s true that eggs that are fresh are more difficult to peel than those that are older. But with the kitchen tip I will share here, even the youngest eggs will be a breeze to peel. Intrigued? Keep on reading. 1. Place eggs in a saucepan big enough to hold all of the eggs in a single layer. 2. Cover the eggs with cold water – there should be enough water to cover the eggs by about an inch. 3. Add a pinch of baking soda to the water and gently stir. This is one of the keys to help you peel eggs quickly and easily. 4. Bring the water to a boil over medium high heat. 5. 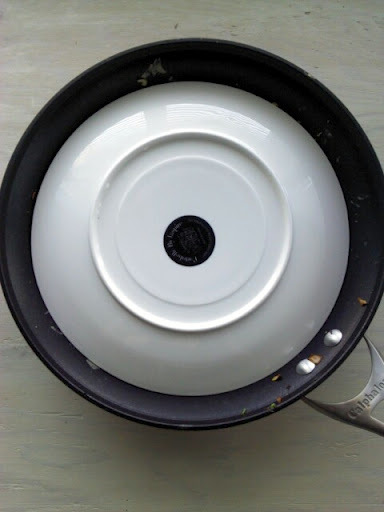 Remove the saucepan from heat, cover with a tight lid and set your timer for 12-15 minutes (12 for small eggs, 13 for medium, 14 for large, and 15 for extra large). Leave the eggs covered, in the hot water, until the timer goes off. 6. Transfer the eggs into a large bowl with water and ice (ice bath) and let them cool completely. 7. Tap and roll the eggs gently on a counter and peel, starting with the fatter end of the egg. The peel comes off like magic! If you are boiling eggs for breakfast, I suggest you boil a few extra to keep on hand for egg sandwiches, potato salads, or to enjoy the eggs as they are. Below is the picture from weekend breakfast. Perfectly hard boiled eggs, peeled, quartered, drizzled with sunflower oil and seasoned with salt and pepper. In the middle is a salad of roasted vegetables with parsley and olive oil. The beverage of choice: basil iced tea. Art doesn’t happen strictly on canvas. Art can, and does, happen everywhere. Even in my kitchen! 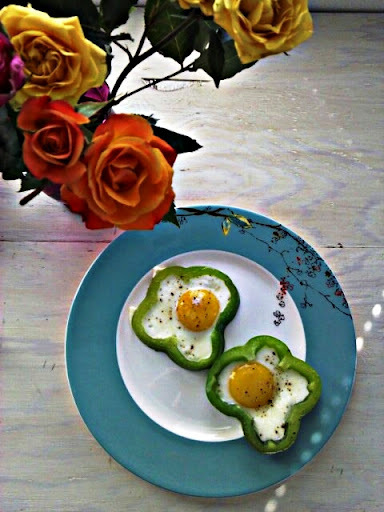 One morning, the Artist was set on making Sunny Side Up Eggs Inside Bell Pepper Slices. He must have heard me talk about this fun recipe and seen pictures I shared from Pinterest. Have you checked out the site yet? Be sure you have hours of free time to browse, and while you are there, you might as well look me up, under snackingkitchen, of course. But back to the eggs, the Artist headed to the store, early in the morning, to pick up a pepper, and came back with a huge, organic, green bell pepper. I would’ve chosen a different color, but his palate dictated the serenity of green. While this recipe was prepared by an adult, it will work equally well prepared by children! So please, be sure to cook this with your kids! They will love it, and they will love you for letting them in the kitchen. 1. Heat olive oil in a large nonstick skillet over medium high heat. 2. Saute pepper slices on one side for 2-3 minutes. The skillet needs to be large enough to fit 4 slices of pepper without overcrowding them. 3. 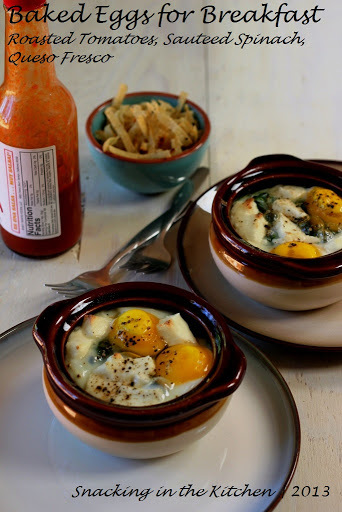 Crack eggs into individual small bowls. Be careful not to break the egg yolks. 4. Flip pepper slices to the other side and lower the heat to medium. 5. Pour each egg inside a pepper slice. Magic – the pepper holds the egg within its borders. 6. Cook the egg to desired doneness and season with salt and pepper right before serving. This was fun to make and even more fun to eat. Next time, I’ll use an orange bell pepper, or perhaps even a large poblano. While the eggs are cooking, I would recommend toasting a piece of toast and lightly buttering it to later dip the bread into the rich, soft yolk. Let’s face it – I haven’t been to the grocery store in longer than I would like to admit, but when it comes to making breakfast, I couldn’t present the lack of groceries as an excuse not to cook. So I turned the contents of my fridge, saving an ingredient or two in the process, into this Easy Chicken, Kale and Bell Pepper Frittata. I used leftovers of rotisserie chicken, a cut up bell pepper, and kale, that would’ve completely wilted the next day. 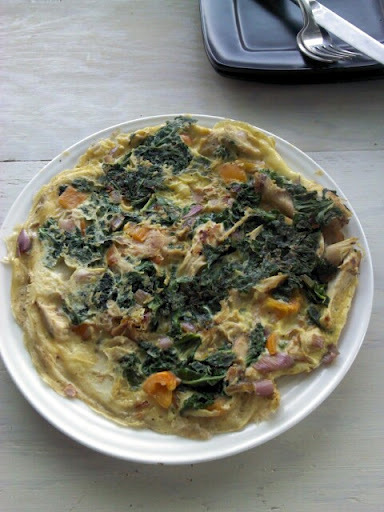 Be sure to scroll down to see my hint for “flipping” frittata to ensure it cooks evenly on both sides. 1. Heat olive oil in a large nonstick pan over medium heat. 3. Pour in beaten eggs, and lower the heat. Cook the eggs gently, until they set on the bottom. Use a heatproof spatula to gently push uncooked eggs to the bottom of the pan. 4. 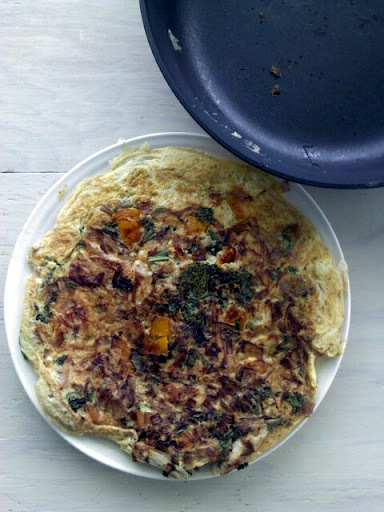 Place a plate over the skillet, and flip the frittata onto a plate. Gently transfer frittata back to the skillet and cook on the other side for a few minutes. 5. 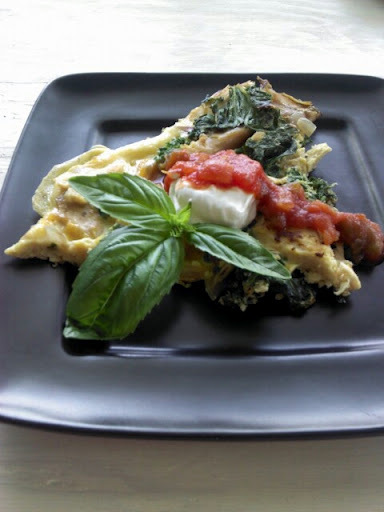 Flip frittata again, slice into wedges and serve with sour cream, salsa, and basil. 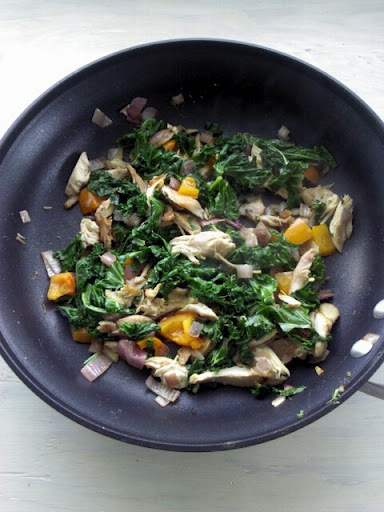 And here you have it – easy, chicken frittata recipe with kale and bell peppers – healthy, quick, and cleans up your refrigerator too! 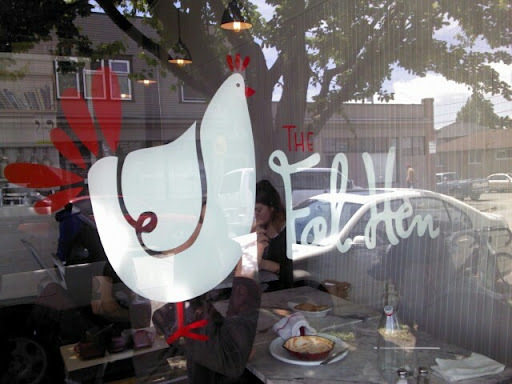 Brunch at the Fat Hen in Seattle – Will it Make You Fat? 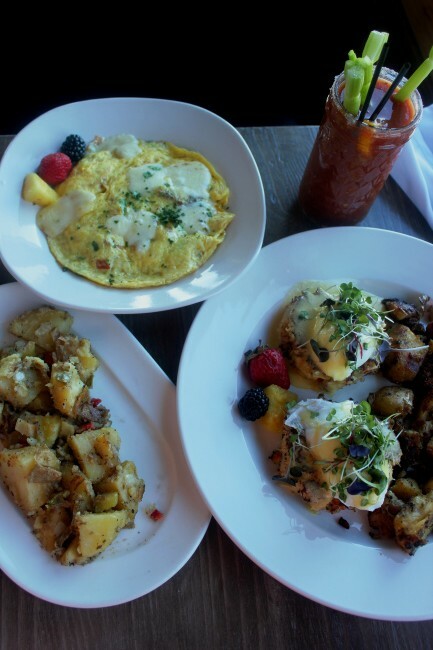 One of the best things about the weekend is brunch! Alcoholic beverages in the morning, hanging out with friends, crisp fried potatoes, and bright oozing egg yolks. As much as I cook brunch at home, I love going out for brunch and have someone else wash the dishes. 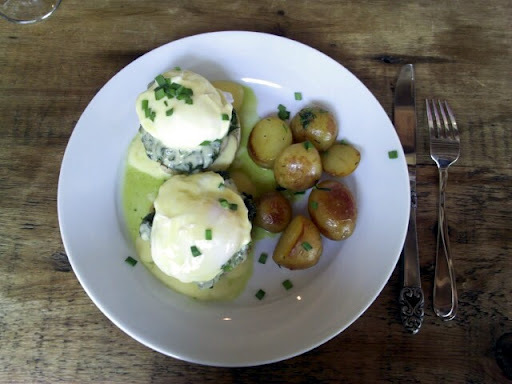 Last week, my dear friend Lera took my sister and me to her local neighborhood brunch place – The Fat Hen. Two words – charming and delicious! 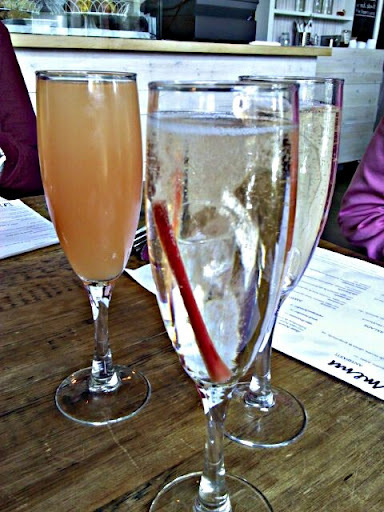 We started with drinks – 1 grapefruit with sparkling wine, and 2 rhubarb fizz with a piece of candied rhubarb inside. A few of us …. I’m not going to name any names, had a second round of drinks before the end of brunch. 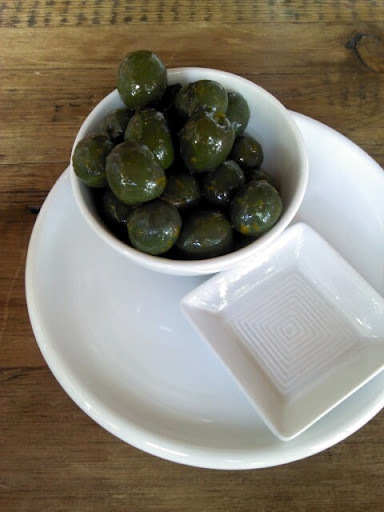 While waiting for our main course to arrive, we nibbled on a bowl of delicious cured olives, bathed in olive oil and dressed with orange zest. I snapped a photo of my Eggs Benedict served on a house-made English muffin with a thin slice of Canadian bacon, hollandaise and roasted new potatoes. To make it just a bit healthier I requested an addition of spinach to the eggs. These tasted as good, or better, as they looked! 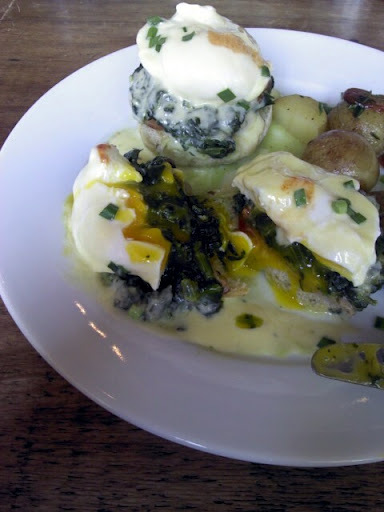 The hollandaise was light and creamy, with just enough acidity. The potatoes were lovely and tender. And the running yolk ran around the plate, bringing all the flavors together. 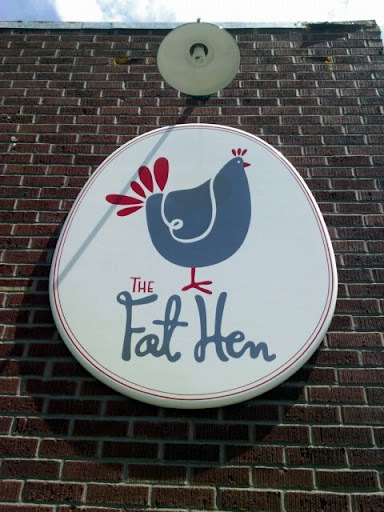 Next time you are in the mood for brunch, stop by at The Fat Hen. Imitation is the greatest form of flattery, but what happens when you imitate yourself? In my case, you come up with yet another combination of ingredients for the Muffin/Cupcake Individual Breakfast Frittatas. 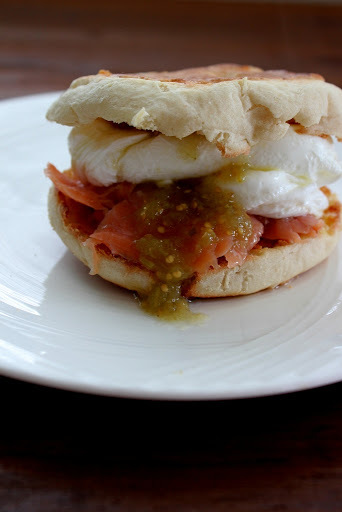 This time around, I build these mini-in-size but colossal-in-flavor breakfast delights around smoked salmon and a roasted poblano pepper. Along with the salmon and the pepper, I threw in a few other refrigerator hermits for color, texture, and flavor. 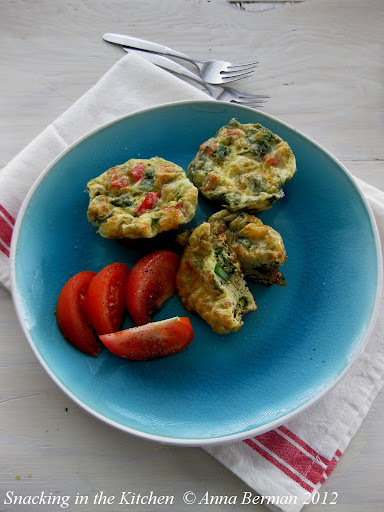 Just in case you might be curios about the origins of this recipe, previous versions include Broccoli and Italian Sausage Egg Muffins and Roasted Vegetable Frittatas. 1. Preheat oven to 375 degrees. Liberally spray a 12-cup muffin tin with non-stick olive oil spray or grease with butter. 2. Combine smoked salmon, poblano and bell peppers, and asparagus in a bowl. Evenly divide the ingredients among the 12 muffin cups. 3. Whisk together eggs, half and half, dill, oil, baking powder, cayenne, salt and pepper. 4. Pour the egg mixture over the salmon and the vegetables. Use a ladle or a liquid measuring cup with a spout to make pouring mess-free. 5. 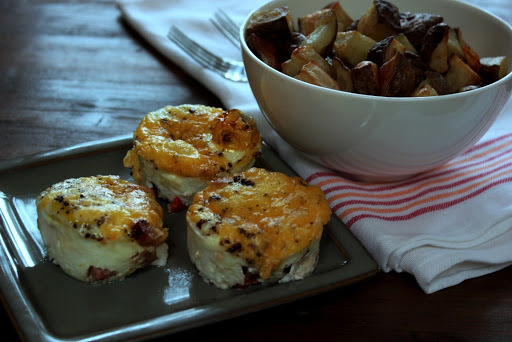 Sprinkle frittatas with Mozzarella cheese. 6. Bake for 20 minutes or until the eggs are set and the cheese has melted. 7. 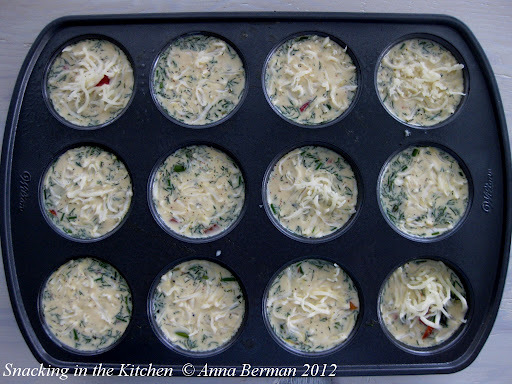 Cool frittatas slightly and remove out of the muffin tin; serve immediately. 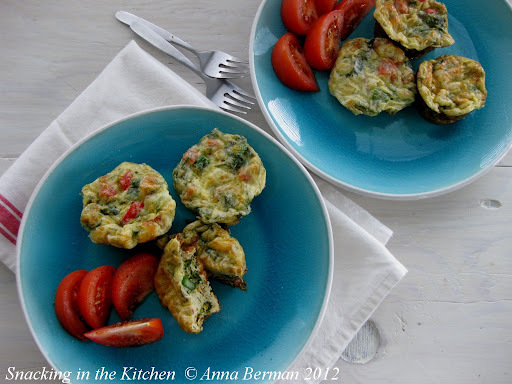 Try using a paring or a butter knife to run along the edges of the frittatas to help releasing them from the pan. 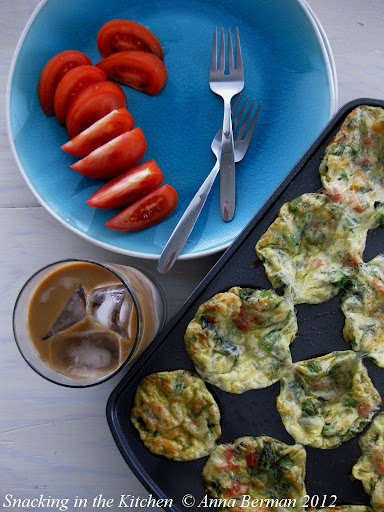 If you happen to have a few frittatas leftover, wrap them well in plastic wrap and freeze them for last-minute brunch guests or for daily breakfast-on-the-go. Apparently I cook and write about breakfast/brunch quite often! 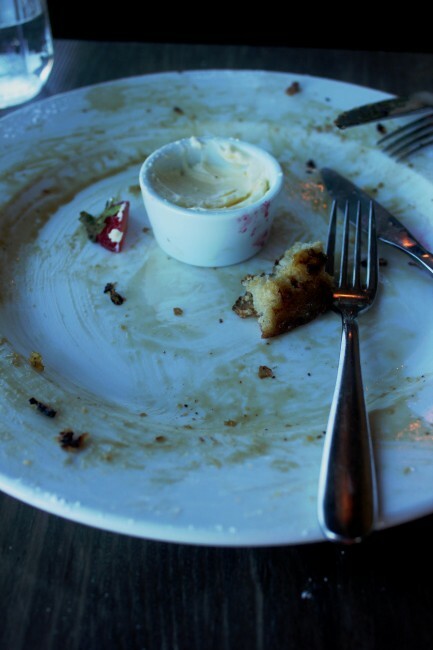 So often, in fact, that one of my friends, Diana, suggested I dedicate the whole blog to breakfast only…Boring! But in all seriousness, I love breakfast. I especially love breakfast on the weekend, when breakfast doesn’t start until at least 10 am, and can be enjoyed leisurely in the company of someone special, with mood music coming from Pandora. 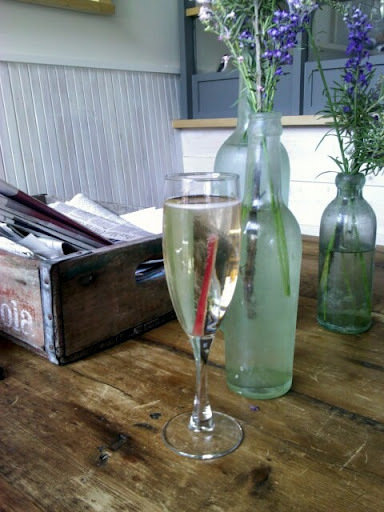 Last weekend, I decided that breakfast must include Champagne! And so with a chilled bottle of Champagne in the refrigerator (alright, let’s be honest – it was a bottle of sparkling wine, but let a girl dream a little, ok?) I began chopping sweet potatoes, bell pepper, and onion and heating up a cast iron skillet in the oven. Cracked eggs and toasted bread followed. Sadly, I was once again reminded that I turn into a useless ball of tired after a single mimosa, and spent the rest of the day in dire desire of a nap. I did manage to pull myself together after a 90-minute nap to visit my parents and wash and fold 2 loads of laundry. Yay me! I am Super Woman, hear me roar. 1. Preheat oven to 450 degrees. Place a large cast iron skillet inside the oven. 2. Mix sweet potato, bell pepper, and red onion in a bowl. 3. Add sugar, paprika, and salt and pepper to taste. 4. Drizzle olive oil and gently toss to coat all ingredients evenly. 5. 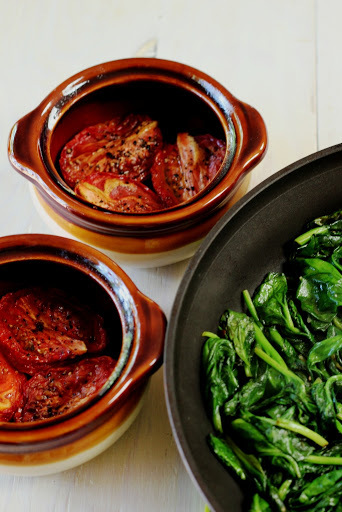 Transfer vegetables to a hot cast iron skillet. 6. Roast vegetables for 30-40 minutes, stirring halfway through. 7. 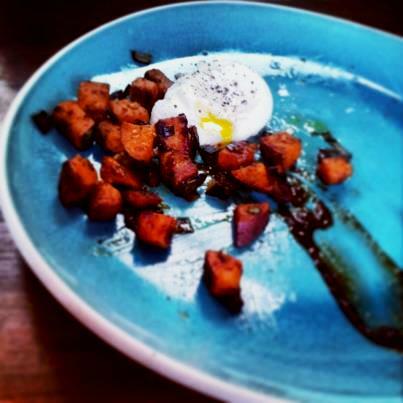 Serve Roasted Sweet Potato, Bell Pepper and Red Onion Breakfast Hash with a sunny side up egg, toasted bread, and a glass of mimosa. 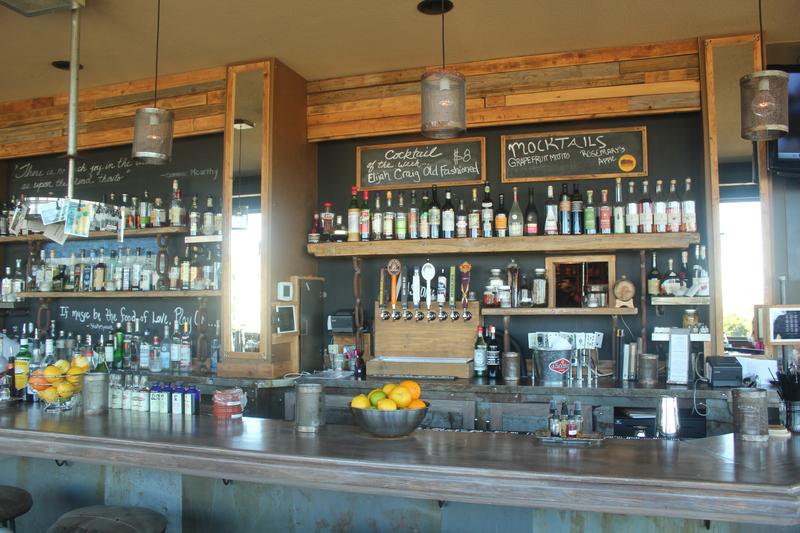 When it comes to mixing up your mimosa, you are your own bartender! I prefer orange juice without pulp. Freshly squeezed is truly the best. I compose my mimosa of 50% juice and 50% champagne. Feel free to discover your own ideal proportion. As you can tell, my breakfast partner chose 0% juice and 100% champagne. Last week, I worked as a personal chef for a family, creating daily dinners. The challenge was to create family-friendly, healthy, and flavorful meals that were also kosher. A protein, a starch, a vegetable, a salad…oh, and also a dessert! On the last evening of my assignment, I made a Pear and Blueberry Clafouti following a recipe from Ina Garten (I added blueberries and skipped pear brandy. Also, I used large eggs instead of extra large). The family loved the dessert and so did my friend Alla (aka THE pho buddy). 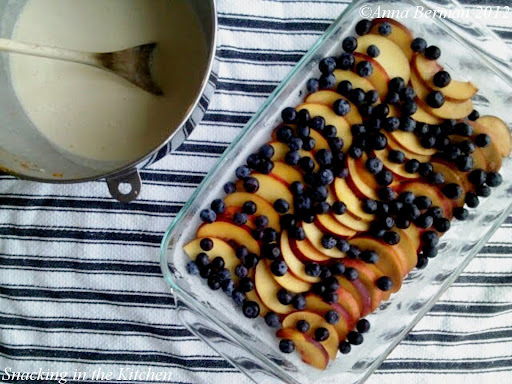 In fact, Alla loved it so much that we met up in her kitchen the very next day to make yet another version of this recipe: Peach, Nectarine and Blueberry Clafouti. Don’t you just love saying “clafouti”? 2. Butter a 10×13 baking dish and sprinkle with one tablespoon of sugar (use extra sugar, if needed). 3. Beat together 1/3 cup of sugar and three eggs until pale yellow, about 3-4 minutes. 4. Slowly add flour, heavy cream, vanilla, zest, salt, and Peach Schnapps. Set the batter to rest for 10 minutes. 5. 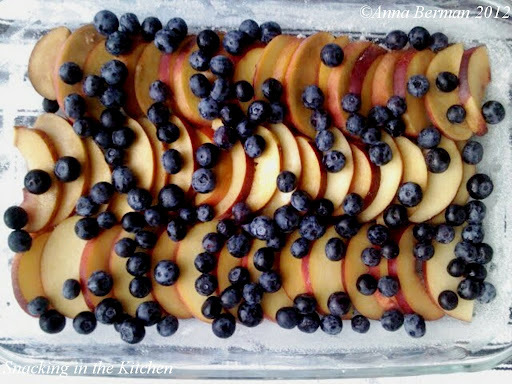 While the batter is resting, arrange slices of peaches and nectarines on the bottom of the baking dish, alternating the fruit. Sprinkle with blueberries. 6. Pour the batter over the fruit and bake until the fruit is golden brown and the custard is firm, about 35-40 minutes. 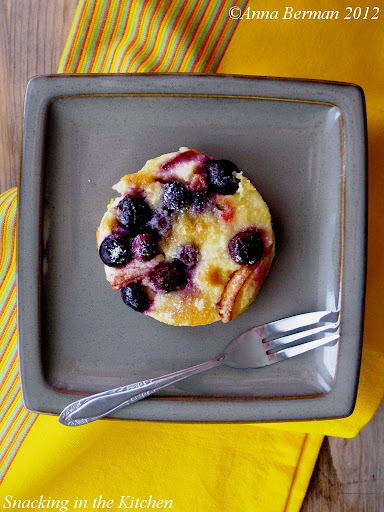 Ina suggests serving the clafouti with confectioners’ sugar and creme fraiche. 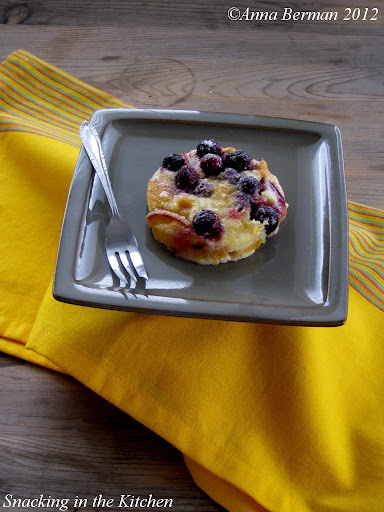 Note: If eating clafouti the next day, sprinkle the top with extra sugar and place under the broiler for a few minutes. You will have a delicious, bruleed version of this dessert. Note 2: Winter is not the best time to be cooking with peaches and nectarines. The flavors would be a lot brighter and sweeter during the peak of summer.